The aims of this study were to analyze biochemical and morphological responses (glutathione S-transferase activity and branchial lesions) in Ucides cordatus (crabs) and to verify how the species is responding to environmental contamination in a port (potentially contaminated area) and mangrove (reference area; Amazon Coast, Maranhão, Brazil). Adult males were captured bimonthly for a period of 1 year. Higher GST activity (1.03 ± 0.07 μmol min−1 mg protein−1) was observed in crabs in the port when compared with those in the reference area (p < 0.05). The greatest number of branchial lesions (serious alterations) was recorded in crabs only in the port area. The GST activity increased until serious lesions appeared; after this limit, GST activity decreased dramatically to very low levels, thus resulting in irreversible lesions (lamella collapse). The mathematical model based on the two parameters evaluated in U. cordatus showed that the port area experienced substantial contamination impact, while the mangroves (reference area) presented moderate environmental quality. 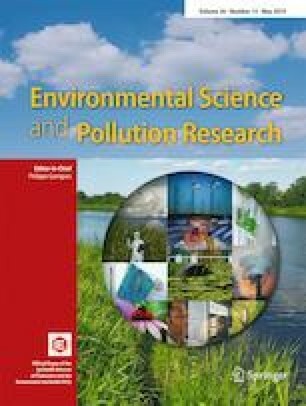 The authors thank the staff of the Laboratory of Biomarkers in Aquatic Organisms (LABOAq), the Research Group in Ecotoxicology and Monitoring of Aquatic Environments (GPEMAAq) and Group in Aquatic Biology (BioAqua) for technical support. We also thank the Maranhão State Research Foundation (Fundação de Amparo à Pesquisa e ao Desenvolvimento Científico e Tecnológico do Estado do Maranhão-FAPEMA) for the financial support and the Coordination for the Improvement of Higher Education Personnel (CAPES) for the granting of the master’s degree to the second author. We thank Catherine Dandie, PhD, from Edanz Group (www.edanzediting.com/ac) for editing a draft of this manuscript.